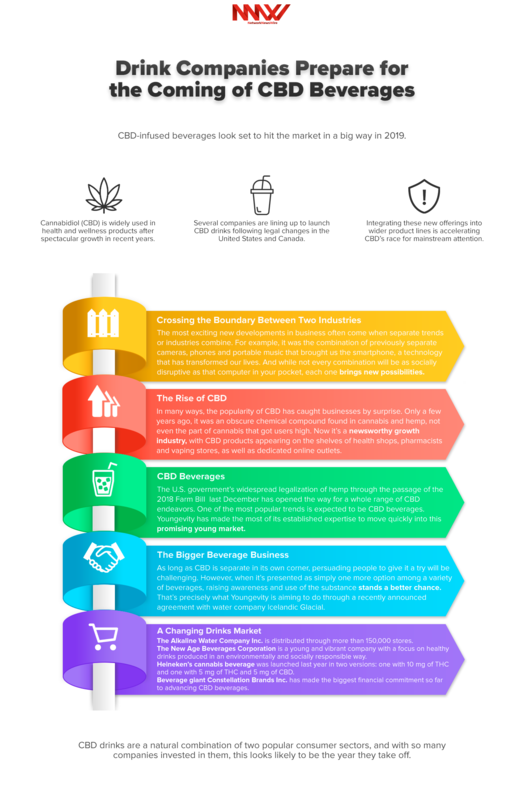 In many ways, the popularity of CBD has caught businesses by surprise. Only a few years ago, it was an obscure chemical compound found in cannabis and hemp, not even the part of cannabis that got users high. Now it’s a newsworthy growth industry, with CBD products appearing on the shelves of health shops, pharmacists and vaping stores, as well as on dedicated online outlets. The trend has also led to the rise of new companies as well as investment from the likes of Youngevity International Inc. (NASDAQ: YGYI). CBD isn’t everywhere yet, but it’s feeling close. Hi-Fi Hops, Heineken’s (OTCQX: HEINY) cannabis beverage, was launched last year in two versions: one with 10 mg of THC and one with 5 mg of THC and 5 mg of CBD. The product is sold in California’s cannabis dispensaries and is the result of a collaboration between AbsoluteXtracts, a manufacturer of cannabis-based products, and Lagunitas. “The idea of being a part of a no-calorie beverage infused with cannabis seemed like a perfect next step in our product innovation and a natural way to marry our past with our future,” said Lagunitas CEO Maria Stipp.